Some time before August 23 2001, a small Indonesian fishing boat, the KM Palapa 1, left Indonesia en route to Christmas Island with 438 asylum seekers aboard. Like many before them, the asylum seekers hoped to reach Australia and apply for permanent protection visas. The Palapa’s engines failed in international waters between Indonesia and Australia, and it lay stranded for many days. On August 26, the MV Tampa, a Norwegian cargo ship en route from Fremantle to Singapore, answered a call from the Australian Coast Guard and rescued the crew and passengers of the Palapa. Makeshift accommodation and bathrooms were organised on the open deck. Pregnant women were among the passengers. A delegation of five asylum seekers was taken to see the Tampa’s captain, Arne Rhinnan. They pleaded to be taken to Christmas Island (four hours away) and threatened to jump ship if they were returned to Indonesia (11 hours away). Rhinnan told the coast guard he planned to take the rescuees to Christmas Island, which was duly noted. However, some hours later, Neville Nixon of the Department of Immigration contacted Rhinnan to inform him that the Tampa was not to enter Australian waters – and if it did so, Rhinnan risked imprisonment and fines of up to A$110,000. It was the prime minister, John Howard, who decided to prevent the Tampa entering Australia. The decision heralded the beginning of a new, executive-led change in policy, which has been the underlying basis of the approach to asylum seekers attempting to reach Australia by boat ever since. When the 438 asylum seekers left Indonesia on the Palapa, Australia’s policy was to rescue asylum seekers at sea and detain them in Australia while their claims for protection were processed. If their claims were successful, they would be released into the community on permanent protection visas. If they weren’t, they would be returned to their country of origin. On October 8, six weeks after the Tampa was told it could not enter Australian waters, the Palapa survivors were forcibly removed from the HMAS Manoora onto Nauru. In the intervening period, the Australian government had introduced a policy of boat turnbacks. The ability to construct and implement this policy less than three months out from an election was an extraordinary achievement of the Howard government, particularly given it involved complex negotiations with a foreign country (Nauru). Also in this six-week period, ten more boats (now labelled Suspected Illegal Entry Vessels, or SIEVs) attempted to reach Christmas Island. It was a period of high drama. The Australian Navy was under orders to forcibly return boats to Indonesia under Operation Relex. Several boats sank under navy observation. Despite the best efforts of navy personnel to rescue asylum seekers flailing in the open sea, many people drowned. In the case of SIEV-4, cabinet ministers seized on a navy communication feed that children were being thrown overboard. They immediately made the allegation public; Howard and his immigration minister declared these were not the type of people Australia wanted. The government maintained its reliance on unverified naval intelligence right up to the federal election on November 10, without providing the navy with an opportunity to correct the record. This politicisation of navy information was the subject of a Senate inquiry in the next parliament. Boats ceased arriving altogether after SIEV-10 sank on October 19, killing more than 350 of its 400 passengers. The exact circumstances of the sinking of SIEV-10 remain uncertain. There can be little doubt, however, that its sinking had a significant deterrent effect on asylum seekers in Indonesia considering the journey to Christmas Island by boat. At the time of the Tampa incident, the government’s new policy of boat turnbacks seemed extreme. However, the government ran a highly successful campaign claiming that the policy was necessary to control Australia’s borders and keep the nation safe, particularly in the aftermath of the September 11 attacks. The government kept strict control of information. It withheld information about navy operations involving asylum seekers at sea and restricted the access of journalists to Nauru and Christmas Island. It also downplayed the effect of offshore detention on the mental and physical health of asylum seekers, and cast rescuees as undeserving of Australia’s protection – and potentially a risk to security. The Rudd Labor government ended the Howard government’s asylum-seeker policy in 2007. Offshore detention centres were closed; boat turnbacks ceased. But, from 2010 to 2013, boats began arriving in unprecedented numbers, and Tony Abbott and the Coalition were elected on a platform that included “stopping the boats”. The Abbott government introduced a new policy mirroring the post-Tampa policy – which included an added sting introduced by the Rudd government prior to the 2013 election that no asylum seeker arriving by boat and processed in an offshore detention centre would ever be resettled in Australia. This present-day asylum-seeker policy has bipartisan support. It is a direct legacy of the Howard government’s decision to refuse entry to the Tampa in August 2001. Part of a black cotton cushion cover depicting the Australian coat of arms embroidered by Lance Corporal Alfred Briggs (Albert Biggs), 20 Battalion, AIF. Albert Biggs, a labourer from Sydney who enlisted in the Australian Imperial Force under the name Alfred Briggs, was 23 when he arrived in Gallipoli on 22 August 1915. Biggs, as part of the second reinforcements for the 20th battalion, fought to defend the Anzac trenches on the ridge known as Russell’s Top, from where the ill-fated 3rd Light Horse Brigade had launched their attack for the Battle of the Nek. His battalion was evacuated to Egypt in December 1915 and sent to the Western Front the following April. Biggs was awarded the Military Medal for “great initiative and bravery” at Lagnicourt on 15 April 1917, but he was severely wounded at the second battle of Bullecourt on 5 May. Shrapnel flew into his left knee, leaving it permanently fused, and his right humerus was shattered. This damaged the nerves in his arm so badly that he could scarcely use his right hand. Biggs spent nearly 12 months in hospital in Rouen, France, before being moved to the Tooting Military Hospital in London, where he was first encouraged to take up embroidery. He returned to Sydney in September 1918 and spent almost two years at the 4th Australian General Hospital at Randwick (where the Prince of Wales Hospital stands today), and convalescent homes. He was discharged from the army in 1920. Biggs was one of more than 156,000 Australian men who were wounded, gassed, or taken prisoner during the first world war. Like many of his comrades, however, it is also likely that he suffered from some form of shell shock. Many of the hospitals tending the wounded during and after the War provided bright, clean, quiet environments where the men could perform meditative, transformative work that was essential to their rehabilitation from their physical and mental wounds. One such activity was embroidery, also known as “fancy work”. Embroidery was widely used as a form of therapy for British, Australian, and New Zealand soldiers wounded in the War – challenging the gendered construct of it as “women’s work” that was ubiquitous throughout the 19th century. Embroidery depicting a French farmhouse, stitched by 2626 Private William George Hilton. Hospitals in England, France, Australia, and New Zealand all offered embroidery therapy and important examples of the soldiers’ work can be found in places such as the TePapa Museum in Wellington, New Zealand, the Australian War Memorial Museum and St Paul’s Cathedral in London, where the beautiful embroidered Altar Frontal was created by wounded soldiers from the UK, Australia, Canada, and South Africa. Themes of the soldiers’ embroidery ranged from military heraldry to scenes from the French countryside to pieces for their sweethearts. The 4 AGH in Randwick had vast recreation facilities to help with soldiers’ rehabilitation and occupational therapy. Staff encouraged Biggs to resume embroidery to pass the time and develop the fine motor skills in his left hand. The Australian War Memorial holds at least four examples of Biggs’ embroidery. 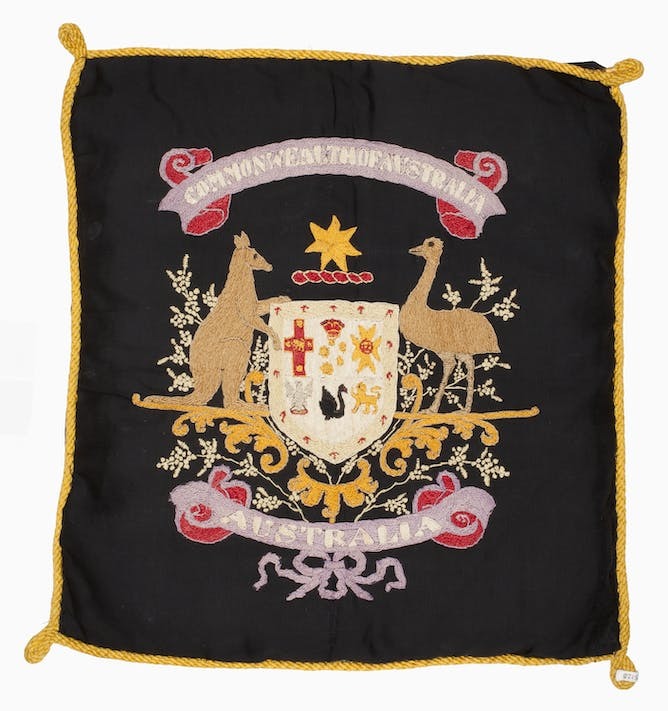 One, which he completed while at the hospital in Randwick, shows a cushion with the 1912 Australian coat of arms sewn in stem, long, and satin stitch onto a black background. The full cushion bearing the Australian coat of arms sewn by Albert Biggs. From what we know about Biggs’ service, we can surmise that this choice of embroidery pattern was bound to a constancy in his identity throughout his army experiences. Once a labourer, the war had made him a soldier, a war hero, and an invalid but he remained, above all, Australian. Six multi-coloured butterflies embroidered on the back of the cushion cover decorated with the Australian coat of arms by Lance Corporal Alfred Briggs (Albert Biggs), 20 Battalion, AIF. Biggs also created a piece with six gold daisies and four sprays of red berries and a piece with a King’s crown with crossed Union flag and Australian ensign, all within a laurel wreath. A scroll bearing the words, “For England home and beauty” sits above the piece; and a scroll reading “Australia will be there” below, but the rest of the pattern is unfinished. Creating these delicate works was a great achievement for Biggs as the skill would have taken him years to master; it is not unlike a right-handed person learning to write again neatly with their left hand. The soldiers’ work also created economic opportunities. Their embroidery and other ornaments were sold at the Red Cross Hospital Handicrafts Shop in Sydney where visitors were encouraged to “purchase the work of returned soldiers to help them help themselves”. The Red Cross also supplied printed templates for embroidery, many of which bore patriotic messages, such as the piece that Biggs left uncompleted. One hundred years later, the story of Biggs’ bravery in Gallipoli and France has been stitched into the broader “mythscape” that surrounds Anzac Day. His embroidery, however, speaks to us of the quiet courage and dignity of Australia’s soldiers as they tried to mend their shattered lives following World War I. And interestingly, two recent studies have helped articulate the rationale for rehabilatation embroidery. One has demonstrated that undertaking everyday craft activities is associated with emotional flourishing, revealing the importance of handcrafts to their makers. Another study has shown that embroidery and sewing can allow individuals to work through mental trauma associated with war. Highlighting the practice of rehabilitation embroidery gives us new ways to remember Biggs and the 416,809 Australian men who served in WWI. The stories they stitched into their embroidery allow us to remember them as we grow old. 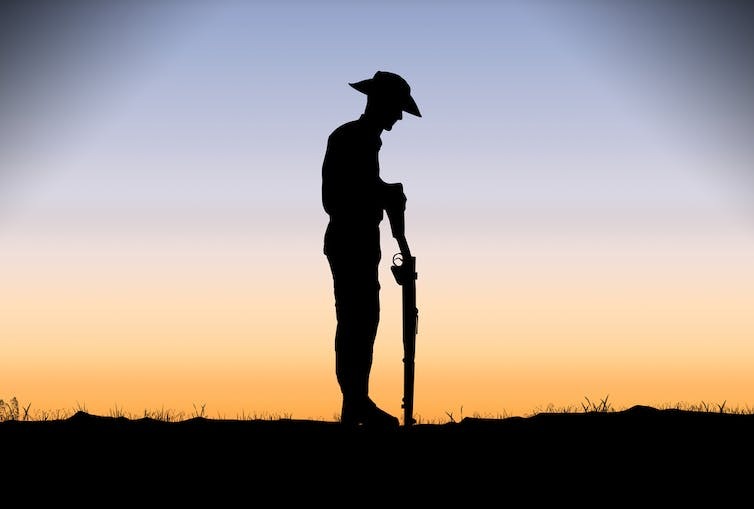 Australians are deeply attached to the cluster of beliefs and traditions we call the ‘Anzac legend’. Australian soldiers and their dugouts built on the hillside overlooking the landing area at Gallipoli. 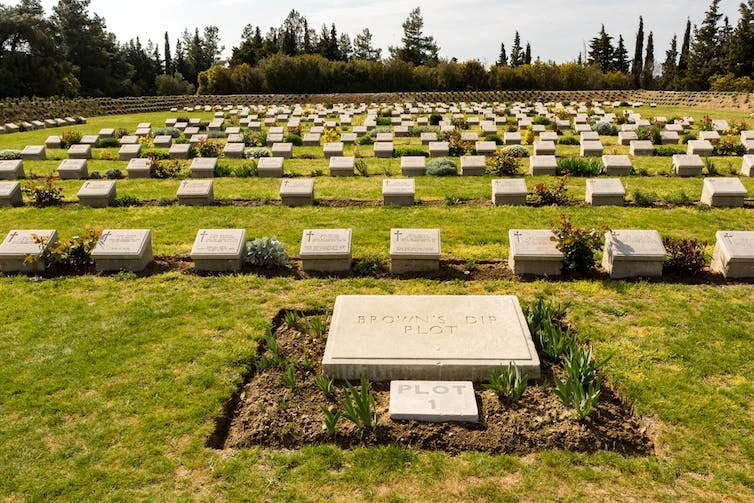 Monuments to British and Australian army forces in Gallipoli in Canakkale, Turkey.